Imagine looking out into your backyard or property and a beautiful shed looks straight back at you well of course with some weekend hard work involved, now with good weather approaching no need to put if off get the ball rolling with some great ideas. This project could get the think tank of shed ideas happening sooner than later there are many concepts but a simple plan will help move it faster look at some simple shed plans to bookmark this project. 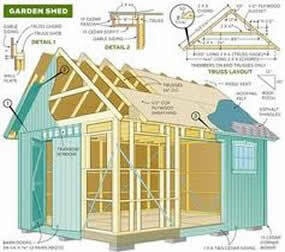 Getting ideas for a good shed plan here we have some simple designs that can be done over a holiday period. With many materials available from your local supplies or sourced from neighbours. Many projects can be completed from recycled materials saving costs. Shed for tools or storage can add considerable value to an existing property many properties suffer lack of safe storage area and good design. Good shed design can offer a good work and relax centre away from the main house and a hectic lifestyle. With some imagination designing your shed could take on a whole new dimension depending on your project needs and lifestyle needs will other members of the family or friends be using the shed or is it solely for your needs? Do you need materials storage in the shed what about painting will you need a spray booth area? maybe a crane block and tackle type? so the design and end users and use need to be considered early in the project. Rustic sheds are a part of Australian outback tradition some had a previous life as sheep shearing sheds and cattle sheds with imagination they can take on a whole new life with plenty of history. Many farm sheds served as repair workshops and also living quarters for stockman and jackaroo's many are still in use on large farms.